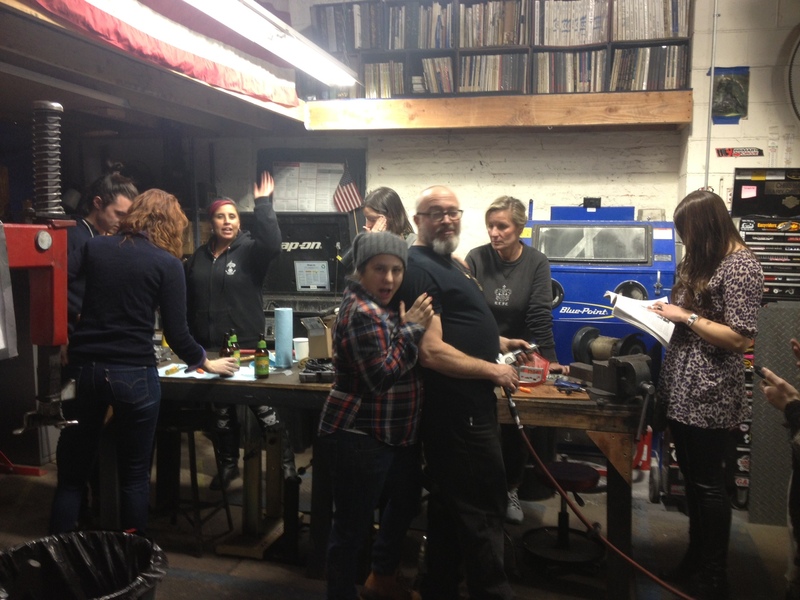 Monday nights this winter are all about my little dirtbike rebuild over at the MotorGrrl garage. Miss-Fires member and MotorGrrl owner Valerie is a fantastic host with beers on ice and music cranked. And leave it to the Miss-Fires ladies to always arrive with baked goods…mmmmm. I’ve had my 1971 Yamaha At1 125 for a few years now and its served me well as an awesome daily rider, and there isn’t much that’s more fun than bouncing around on it on the Red Hook cobblestones. Of course, then the engine got filled up with about a gallon of slime and i was time to give it a little love. 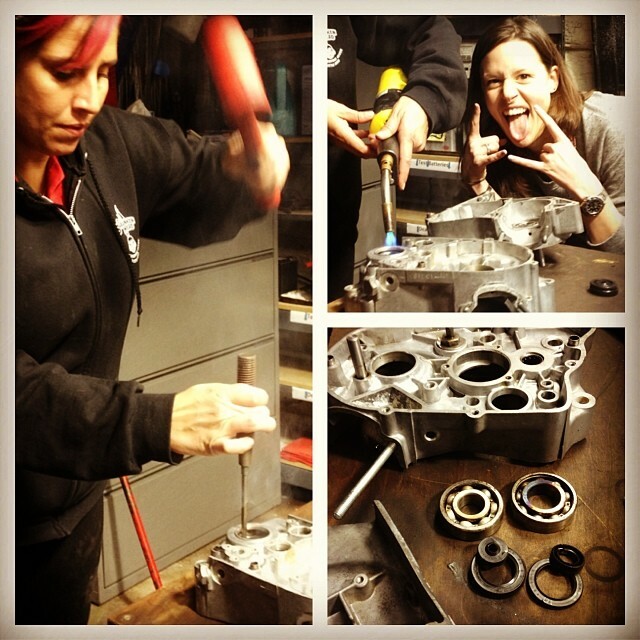 So, with the engine in a thousand pieces, and new parts ordered, Lori works on extracting the old bearings and seals. Heat is used to pop the bearings out easily. And I’m glad we did decide to replace the bearings as on removal, there was a ton of crud between them and the case. Well worth the time and expense. 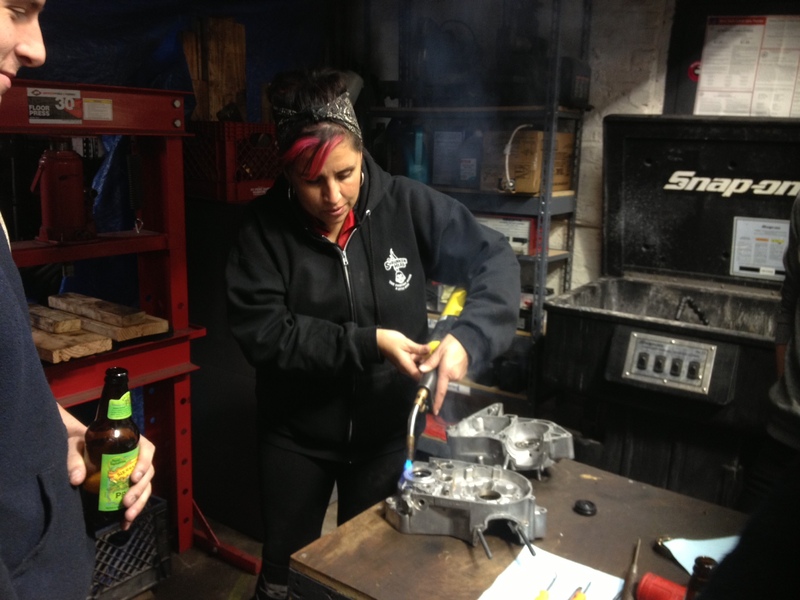 While The ladies worked on the Yamaha bearings and drilled out frozen screws on Steph’s Honda CB350 case, I kept my nose to the polishing wheel, to have the engine cases bright and shiny in time for the whole thing to go back together next Monday night. Of course the best time was probably had by Neville The Devil. This entry was posted in Project bikes, Wrenching and tagged 1962 Ford Ranchero, 1968 BSA Lightning, dirtbike, garage girls, garage night, moto mondays, motorgrrl, the miss-fires, the missfires, vintage motorcycles, wrenching, yamaha at1 125. Bookmark the permalink.